I want to begin by saying “Thank you to the wonderful volunteers from the Humane Society of Northwest Louisiana. The week of April 12 thru 18 is set aside to honor the volunteers that selflessly give of their own time and money to help many causes around the world. It takes a special person to donate their time and energy without expecting anything in return. The world is a better place to live because of volunteers. No matter what your passion, there are heroes out on the frontline making a difference. I want to share two of my favorite references to volunteering. This is a story about four people named Everybody, Somebody, Anybody, and Nobody. There was an important job to be done and Everybody was sure that Somebody would do it. Anybody could have done it, but Nobody did it. Somebody got angry about that, because it was Everybody’s job. Everybody thought Anybody could do it, but Nobody realized that Everybody wouldn’t do it. It ended up that Everybody blamed Somebody when Nobody did what Anybody could have. This next quote is one that motivates me in my writing and everyday life. I think Lily Tomlin is one incredible lady. What would become of the homeless dogs and cats without our volunteers? 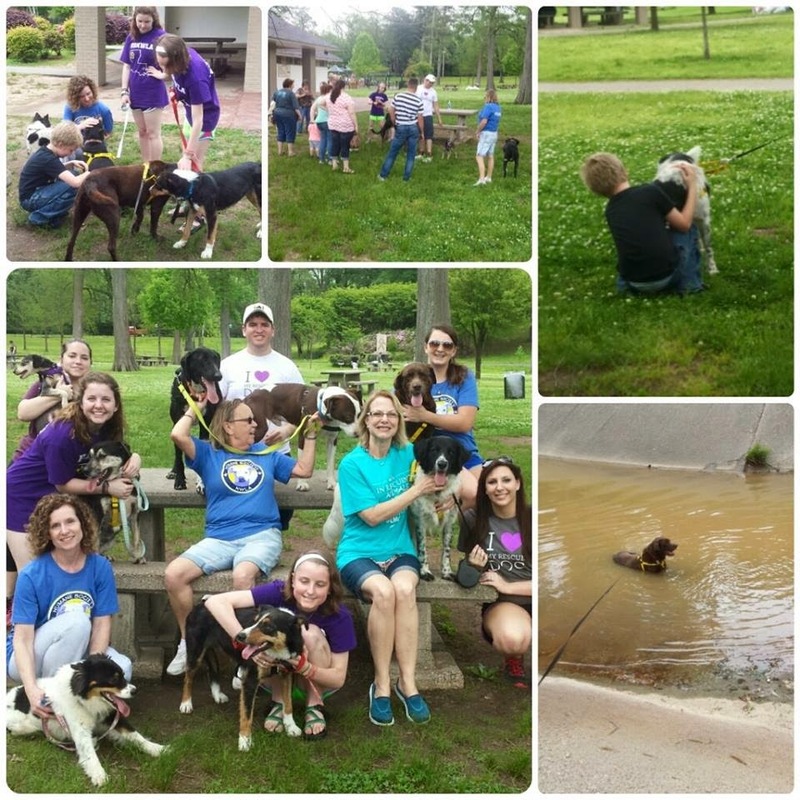 HSNWLA volunteers took pups to the park! They simply would never know love or life. It is not an easy job the shelter volunteers have, many days they deal with the result of extreme animal cruelty or neglect. These women and men go rescue dogs and cats out of horrid conditions, get them to a vet, love them, play with them and help to find them their forever homes. I have volunteered on adoption days and after only a few hours with a puppy, I cried when it had to go back to wait for another chance. It can be heartbreaking, but when you see so many successful adoptions, you learn to remain positive. Not everyone can look in the face of a person surrendering their dog because it poops too much in the backyard and remain polite. The volunteers have this mastered. I’m not that good of an actor and would not be the right person for that job. This was seriously reason given recently when a dog was dropped off at a shelter. How can you volunteer? Not everyone is able to be a hands-on volunteer, but everyone can help. Check with your local humane society or no-kill shelter to ask what they need. Most are always in need of paper towels, bedding, bleach, dog/cat food, cat litter, detergent, and toys. Grab an extra bag or bottle of something on their list to donate. Are you a social media guru? Perhaps you could use your talent on their website, Twitter, or Facebook accounts. Do you know any contests offering to donate to a 501-C3 organization? Sign your favorite shelter to win. I can also help with that last one on the list! If you are planning to attend the BlogPaws Conference, you will be given the opportunity to nominate your favorite shelter to win money. *Important: Deadline is April 15th to nominate, so buy your ticket now! Save 10% with my ambassador code: BP15-Amb-Melissa-10. The second way is to register your organization with Damien’s Best Dog Toys! Each month they draw the name of one lucky shelter to receive some of their fantastic tug toys and cat toys. I am so excited to say that this month’s winner was my submission! The Humane Society of Northwest Louisiana will be receiving a toy package this week! Thank you so much, Mark! If any of you are looking for a super strong fun toy, check out Damien’s Best Dog Toys. My boys love theirs! Most people have organizations that they support. If you don’t, please consider helping the HSNWLA. All contributions are tax-deductible and they now offer dog sponsorships. For more information, join their Facebook page. Take the time to say, "Thanks" to all of the volunteers making lives better! 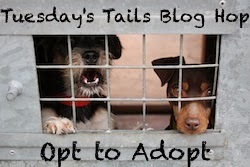 We are always proud to take part in the Tuesday’s Tails. It is a blog hop co-hosted by my friends Dogs n’ Pawz and Talking Dogs. Please take the time to visit and share these pets that are looking for their forever homes. We hope they gets lots of support. Have a terrific Tuesday. Toys for the shelter pets will make them so happy. Good for you! Great quote from Lily Tomlin! It is so true that we are the somebody who can do something to help. Thanks for the mention of our dog toy raffle. We really enjoying meeting all the animal welfare organizations that do great things for the animals. Thanks for sharing HSNWLA work with us. Great post and tribute to those volunteers! Sharing. We love Lily Tomlin too and that is a great quote of hers. I never heard the story of Everybody, Somebody, Anybody and Nobody before but I think it is truly perfect! Everybody can do something! Oh how fabulous! Volunteers are amazing people aren't they ? I just loved the Everybody, Somebody, Anybody and Nobody. The Peeps who Work or Volunteer at Shelters and Rescues and with Transports and Fostering .... are the most FABULOUS folks of ALL..... they have such a SAD "JOB" and they do it with such LOVE and DEVOTION. There are not enough words to THANK them Properly. Wonderful post. Mom said she would have troubles not saying what was on her mind! This is a great post. Volunteers are the best and so many do things that I couldn't. But there is always something that each one of us can do. That is so great that your shelter is getting the Damien's Best toys! We love their toys and all that they do. Having worked for 12 years at our local humane society I can attest to how difficult the job can be especially for the ones working directly with the animals every day. I do my part now to support the rescue group Millie & Walter came from as they pull most of their dogs from our local shelters. The State Humane Society here is a God send for the animals because of all the tornados we see....we have donated and helped here many times and it's always great to see little love ones being found and joined by their peeps! There's lots of different ways to support your local shelter or rescue group. The mom helps ours by writing the thank you notes for donations they receive. A great reminder to all of us Bentley that we should ALL be doing whatever we can to help out. Thank you to all the volunteers for all that you do. Congratulations for winning the toys for your shelter! Thank you to everyone who did their part in helping animals. It's so wonderful of you to recognize your local volunteers, most people don't even notice them. I love the both of these quotes - they are SO true! Getting involved is so important and so rewarding. Great post! Our shelter won toys from Damien's Dog Blog! We can't say enough good things about what they do!